Imagine this. A beautiful exotic beach, half an hour away from sunset. Two people in love and one wedding officiant. That's the ideal wedding I'd like to shoot. The truth is something like that probably comes along once or twice in a career. Unless of course you're one of those irritatingly lucky guys. The fact is weddings are about people. Not just about the couple; it's about the parents, the siblings, the cousins, the colleagues, the aunts and that one embarrassing uncle that flirts with all the young girls. 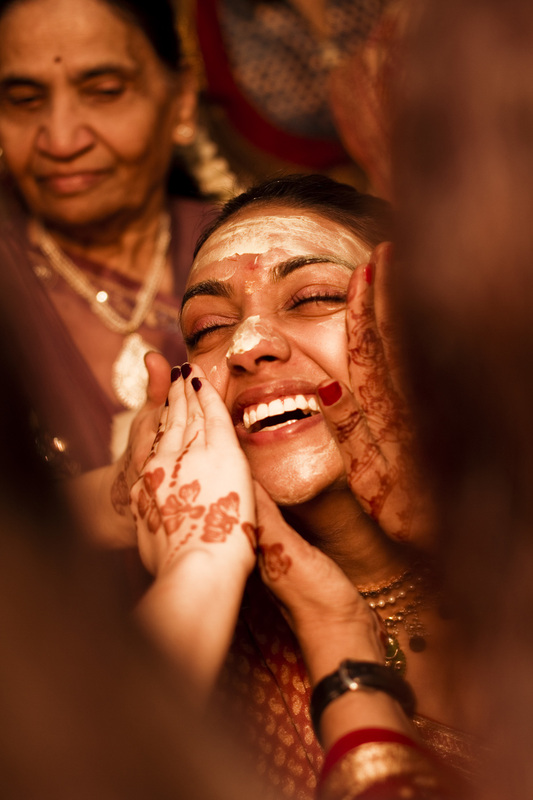 In our culture, this aspect is even more heightened, guests are aplenty in an Indian wedding. I used to grumble about this initially. Until I realised I needed to embrace the idea that they were not an obstruction, but instead, an integral part of the ceremony. It was not just 2 people getting married, it was 2 families being united. 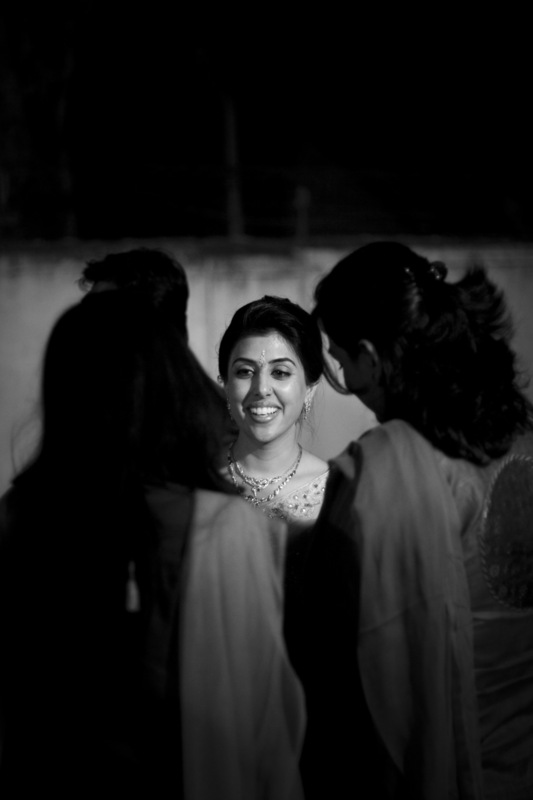 I still clearly remember a moment at my friends wedding in Madurai. It was a classic, traditional South Indian wedding. At one point I took the photograph of him above with an amused grin plastered across his face while he got engulfed by a swarm of family. That moment reinforced my take on this subject. The most obvious one is context. It makes it clear that this moment did not occur in isolation, but in a crowded, festive atmosphere. It increases the distance between you and your subject making it easier to be discreet and capture a truly candid moment. This increase in distance also facilitates the use of longer lenses instead of wide angle lenses that are not very flattering on the human face. Out of focus foreground just adds an intangible magic to the photograph. It borrows from the same principles of cinematography that we use to achieve a film aesthetic or "film look" as its commonly referred to. Utilising the foreground bokeh to channel focus to one part of the image enables you to frame the subject in a crowded environment and still target the viewers attention to what you intended. This particular photograph from Amy & Sarin's wedding is one that I'm very attached to. It is an excellent example of the use of this technique. 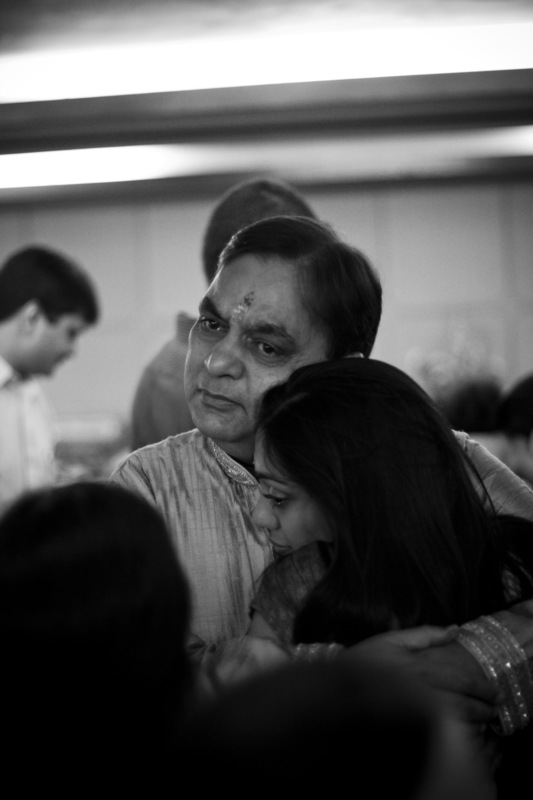 It captures a moment between father and daughter that is timeless and powerful. I doubt I would have gotten this if I was at close quarters. So can this be used all the time? No, it can't. If you have a huge crowd that is unwieldy, your probably going to be fighting for space to get a good photograph. Once you do find a vantage point, it would not be wise to just give it up and position yourself behind guests. You'd probably miss out an important moment in a ceremony. Only use this technique, when you are confident of the crowd you're in and are sure that you can quickly move to a closer vantage point. I've included a couple more examples above of outcomes of this style of composing. I've found it to be very useful at large ceremonies. Give it a shot next time. I hope it would be useful...cheers.